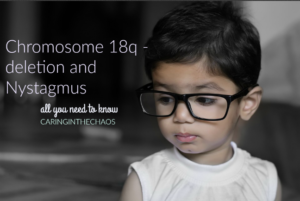 Around 40% of children with Chromosome 18q- deletion have Nystagmus. Nystagmus is a condition that causes the eyes to involuntarily wobble. The eyes can move from side to side or up and down. Nystagmus is seen in around 40% of children that have Chromosome 18q- deletion. This means the Nystagmus is present at birth or is ‘Congenital’. When the cause is unknown it is called Idiopathic. It is believed to affects around 1 in 1000 people. Nystagmus is a life long condition and currently, there is no cure. The impact it has on a child’s vision varies considerably. Nystagmus cannot be corrected by glasses or contact lenses. In some instances, surgery may be suggested as a way to improve the Nystagmus. You may notice in a person with Nystagmus that they hold their head in certain positions – this is because they are using their ‘Null Point’. A null point is where the vision is at its clearest point. Not all people with Nystagmus have null points. Null point positions can also change over time. When this happens the person vision may temporarily deteriorate. Having these varied null positions can lead to discomfort for the person. Head, neck, shoulders may get sore as they keep these unusual head postures to gain the best possible view. It is important that we encourage them to take breaks and move around where possible to alleviate strains and discomfort. It is also important to best try and accommodate their visual needs by positioning them in the best possible and comfortable place to see. Some people with Nystagmus also head nod, which may be a bit disconcerting to others but may help that person with Nystagmus with their concentration. Nystagmus is individual to each person, however, a person with Nystagmus may take longer to process the information they see. Therefore making things clear, less cluttered and allowing them time to process the information is crucial. Those with Nystagmus may also stand very close to the tv as there is a lot of information to process and standing closer can mean the eyes can wobble less. Nystagmus in my experience can change considerably based on the persons wellbeing. Being tired, hungry or unwell can drastically impact the Nystagmus and make it worse. This means the Nystagmus will change across the course of the day. Some people with Nystagmus are more sensitive to light – Wearing sunglasses, hats or parasols on prams to limit direct light will be a great help for them. Being aware of shiny surfaces that reflect light back to them, for example, book pages, can impact on what they can see. Perception such as depth and tracking fast moving objects can be a real challenge for those with Nystagmus, this can impact on activities like stepping, playing games and affect balance. Give those with Nystagmus time to process the information around them. Give them tools to aide them – tablets, magnifiers, large print storybooks, large text, big text on computer screens. Position young children comfortably to view the tv, thinking about height and distance from the screen. Regular exercise to keep muscles healthy and flexible – particularly, neck, shoulders. Regular breaks from activities as having Nystagmus can lead to quicker fatigue.